I love drawing the long straw and getting to profile a trailblazer during 28 Days Later. And somehow, Varian let me get away with profiling both of the YA vanguards. Shh…he may not realize. But these are the authors who have been in the industry long enough to truly say where publishing has been and where it needs to go. How they endure the business-side of writing while still producing great work is among life’s greatest mysteries for me. 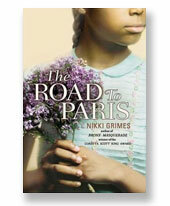 Nikki Grimes has been writing children’s books since the 1970’s. 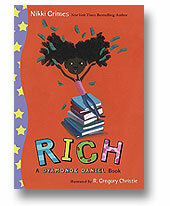 She’s a best selling author and several times over Coretta Scott King winner or honoree. Often, during Brown Bookshelf discussions, we talk about our heavy hitters, the names that people instantly recognize when talking about children’s books by authors of color and Nikki’s name is always among them. What hasn’t a long-time author answered in an interview? What haven’t they already divulged about themselves? I’d venture to guess, not much. Still Nikki was game to indulge me. We talked about the industry and her latest baby, the Dyamonde Daniel series – chapter books about an inquisitive, up and coming, young poet. BBS: Your bio page lists what life as an author is like. It had me in stitches because it’s so true. Ironically, writing is only a small part of a writer’s life, yet you’ve written so much. How do you hear the voices of your characters with so many other things competing for your attention? NG: Not to worry! My characers are both loud and demanding. I couldn’t miss hearing their voices if I tried. And when I attempt to ignore them, they simply do me the courtesy of waking me in the middle of the night! BBS: Selling fiction is tough enough, what special challenges are associated with being a working i.e. selling poet? How do you stay competitive in a field that seems to offer so few opportunities? NG: I don’t wait for opportunities I make my own. Since I’m driven by character and story—not genre—I concentrate on creating stories narratives that are relevant, narratives that I believe will speak to the young readers of today. Poetry is my first love, though, and so many of my narratives take that form. BBS: Share, with us, one change you’ve seen in publishing since your first children’s book that you never thought you’d see? NG: The growing popularity of e-books! Never saw that coming. I was autographing at the National Book Festival this past September, and a young a brought me a Kindle to sign! I nearly fell out of my chair. It’s a brand new day! BBS: Share one thing you have yet to see but would like to see change about children’s book publishing. NG: I would love to see more diversity in editorial and management positions. That would, quite literally, change the face of children’s poetry. BBS: Your latest books are the Dyamonde Daniel series. Dyamonde reminds me of my childhood fave chapter book character, Ramona. What inspired the series? How many books are planned in the series? NG: Over the years, several publishers have approached me about creating a series, but I simply wasn’t interested. Then, about two years ago, I began to wonder: if I were to create a series, what would that look like? The question bored into my psyche and wouldn’t stop until I answered the question. As for the length of my little experiment, Dyamonde is an open-ended series. I’ve no idea how long, or short, the series will end up being. Stay tuned! BBS: Any chances we might see Dyamonde on the big or little screen in time for my five year old to enjoy? Although I’m serious, the true question is, what do you believe it will take to draw more film/TVinterest in books featuring characters of color? Surely it’s not for a lack of intriguing characters. Your books alone offer a myriad of possibilities. NG: I’m not sure how to crack that particular nut. I’ve certainly wondered about it, and I get no end of letters from fans asking the same question. Unfortunately, the people of power in those industries still seem to operate under the false notion that stories featuring characters of color are incapable of appealing to a broader audience. Nothing could be further from the truth. My own readership crosses all boundaries of race, nationality, age, and gender. There most definitely is an audience for these stories. However, it may take a Tyler Perry, or an Oprah Winfrey, or some other industry person of color to bring these stories to the screen. Perhaps BET someone at BET could step into the void. We’ll have to see what happens down the road. NG: Mainstream, definitely. Good stories should be read by all children. Books are one of the chief ways we learn about other cultures, other ways of seeing the world. Stories also teach us that we are all the same beneath the skin. We do reaeders a great disservice by isolating the stories of any one culture from all the rest. Wow, how do you sign a Kindle!!? Ms. Grimes’ bio page made me tired — it’s really true how much time is spent interacting and chatting — and she finds illustrators too!? Wow. NO free time. So glad she took a moment to talk to BBS anyway! My thoughts, too, Tanita. Sign a Kindle? Wow have things changed. I love Nikki Grimes’ work! Can’t wait to share the Dyamonde Daniel series with my daughter. Thank you, Ms. Grimes, for your beautiful books. I enjoy Nikki’s work. 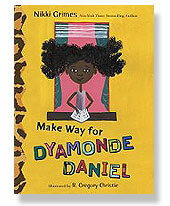 I plan on using Bronx Masquerade in my class during April for poetry month.